This trail covers a wide variety of 17 sundials at 11 different locations in East Lothian (with a slight incursion over the border into Midlothian). It includes several different types of sundials, including the most beautiful sundial of all at Lennoxlove. Click on the sundial trail name to be taken to the trail description. This trail covers the famous Royal Mile in Edinburgh from the Castle at the top to the Palace of Holyroodhouse at the bottom, seeing a variety of sundials along the way. It includes a visit to the National Museum of Scotland to see some significant dials. This is actually three trails in one — The Direct Route to St Andrews, The Scenic Route to St Andrews and St Andrews itself. These can be undertaken individually, as groups of two or all three altogether in the long days of early summer. Go for a wonderful and interesting drive along narrow country roads in the Duns area of the Scottish Borders and see 12 sundials on churches, other buildings and mercat crosses. Follow in the footsteps of Victorian architect Thomas Ross and see several of the sundials that he sketched plus some others as you drive from South Queensferry over the Forth Bridge into West Fife and then over the Kincardine Bridge to Airth. 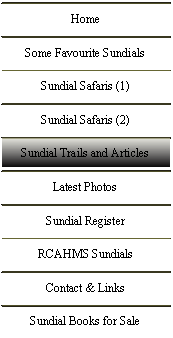 I have written the following articles which have been published in “The Bulletin” - the quarterly magazine of the British Sundial Society. Click on the article name to be taken to the article. Part 12 — A Foray into England!